It is not certain but it is thought that our town has an old history and it was existed in the time of Byzantium Empire and the foundation times of Otoman Empire (1299). This is understood from the historical remnants. We find the latest and clear information in the book of Ottoman Archives Volume 1. the name of our town is ssen as ‘akca-alan’ an it is found out that it has at least 475 years of a history. In that book htere are a map of Kutahya, nicknames, family lists and information in Ottoman Language. The foundation and settlement oaf Akçaalan is not exactly know. But recording to the information from the people in the town it can be said that there was a disorganized settlement at the time of the foundatiın years. The first settlement places ar Dakçaalanı, Madan Mountain, Çukurca. Afterwards, it is said by the elderly people that the town was widened after the Gediz earthquake in 1970 and settled to its ne places without much demage. 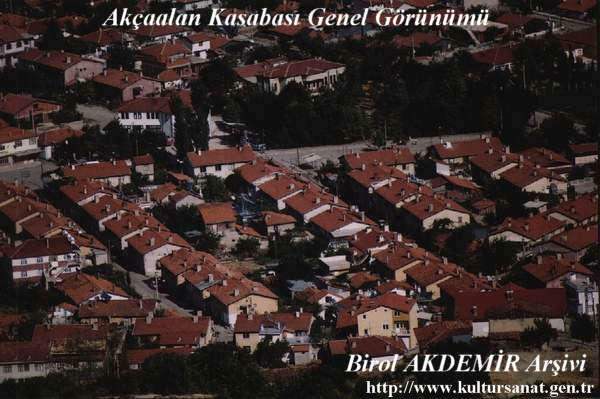 In addition, Deresevindik(Semikler) village was moved to Akçaalan after the earthquake. There are many rumours about where comes the name of the town. According to these rumours; As the place where the town was settlement is a white valleyn and there are white lands around it, the words AKÇA(White) ana ALAN(Land) were joined and the name was formed. We can say that many civilazations existed around the town from the eartenware posts, stones, tiles and eartenware jars, also it was encountered with foundation of old civilizations in some lands. We don’t have definite information about the content of the civilization an whşch period they belong to. In War of Independence our town tookj part actively. Many people from our town joined to the war. During the war, at the time of Greek occupation, our town was occupied for a month. After that, it moved to Çukurca and remained there, when Greeks were in our town, Turkish rebels bothered then very much and some rumours and legends were told about these. In comparison with other towns, it looks like a city. Activities of environmental arregemants and planting tees have been continuing. Population of the town is 2500 in winder, but about 500 in summer as the citizens of our town are coming from other cities and abroad for summer holiday.